Kalaniʻōpuʻu was born about 1729, his brother was Keōua; his son was Kiwalaʻō; he was the grandfather of Keōpūolani. While Kalaniʻōpuʻu was at Hāna he sent his warriors to plunder the Kaupō people. Kahekili was king of Maui at that time, when Kahekili’s warriors met those of Kalaniʻōpuʻu at Kaupo, a battle developed between the two sides. It was known as the Battle of Kalaeokaʻīlio; Kalaniʻōpuʻu’s army was routed and returned to Hāna. Kalaniʻōpuʻu promised revenge and, in 1776, he again went to battle against Kahekili. This battle (known as the Battle of Sand Hills or Ahalau Ka Piʻipiʻi O Kakaniluʻa) was recorded as one of the most bloody. Unfortunately, Kalaniʻōpuʻu was not aware of the alliance between Kahekili and the O‘ahu warriors under Kahahana, the young O‘ahu chief, and these numerous warriors were stationed at the sand dunes of Waikapū and also at a place close to those sand dunes seaward of Wailuku. Kalaniʻōpuʻu’s army was annihilated as they entered the sand hills of Wailuku. In a desperate act to save what was left, Kalaniʻōpuʻu requested that his wife, Kalola, plead for peace from her brother Kahekili. However, knowing that Kahekili would not look upon her with favor, Kalola suggested their son, Kiwalaʻo be sent instead. Kahekili welcomed Kiwalaʻo; for a time, after the great Sand Hills battle in Wailuku, peace and tranquility returned. At the time of Captain Cook’s arrival (1778-1779), the Hawaiian Islands were divided into four kingdoms: (1) the island of Hawaiʻi under the rule of Kalaniʻōpuʻu, who also had possession of the Hana district of east Maui; (2) Maui (except the Hāna district,) Molokaʻi, Lānaʻi and Kahoʻolawe, ruled by Kahekili; (3) Oʻahu, under the rule of Kahahana; and (4) Kauaʻi and Niʻihau, Kamakahelei was ruler. By 1790 Kamehameha I had gained enough control of the island of Hawaii that he could leave to join the war parties on Maui. Their canoe fleet ‘beached at Hana and extended from Hamoa to Kawaipapa” to battle Kalanikupule, son of Kahekili, and ruling chief of Maui while his father was on and ruled Oʻahu. In the election of 1796, under the Constitution as it stood then, each of the presidential electors had two votes, which they were to cast for different men. The one who received most votes would become President; the second-most would be Vice President. John Adams became President and Thomas Jefferson Vice President. In the 1800 election, Jefferson and Aaron Burr (February 6, 1756 – September 14, 1836) received an equal number of votes; Adams was beat. Following a constitutional procedure, the US House of Representatives held a vote to determine the winner. After 35 votes with neither receiving a majority, on the 36th vote, Hamilton put his support behind Jefferson; Jefferson finally won, Burr was VP. When it became clear that Jefferson would drop Burr from his ticket in the 1804 election, Burr ran for governor of New York. Hamilton campaigned vigorously against him. Morgan Lewis, assisted by Hamilton, defeated Burr. Hamilton and Burr did not like each other. Hamilton had called Burr “a dangerous man, and one who ought not to be trusted with the reins of government … (and) expressed … still more despicable opinion” of Burr. Burr demanded a “prompt and unqualified” denial or an immediate apology. Hamilton did neither. Burr insisted that they settle the dispute according to the code of honor. Shortly after 7 o’clock on the morning of July 11, 1804, Burr and Hamilton met on a dueling ground in New Jersey, across the Hudson River from New York. It was the exact spot where Hamilton’s eldest son Philip had died in earlier duel. The death of Hamilton, however, ended Burr’s political career. President Jefferson dropped him from the ticket for the 1804 presidential election, and he never held office again. OK, that was there; what was happening in the Islands? In 1804, Keʻeaumoku (father of Kaʻahumanu (favorite wife of Kamehameha) and a staunch supporter, one of the great chiefs and the first among the war leaders of Kamehameha (one of his “Kona Uncles) died. The maʻi ‘ōkuʻu (believed to be cholera) struck the islands in about 1804. Some reports note about one-half the population (175,000) died, however, some feel that is quite likely that close to 5,000 Hawaiians died from it. (Schmitt) Weather and sickness thwarted Kamehameha’s invasions of Kauaʻi. In the face of the threat of a future invasion, in 1810, Kaumuali‘i decided to peacefully unite with Kamehameha and join the rest of the Kingdom of Hawaiʻi under single rule. Kahekili was son of Kekaulike. Kekaulike descended from Pi‘ilani, founder of Maui’s last ruling dynasty. King Kekaulike and his children built an empire that enjoyed levels of power and prestige greater than any other royal family up until that point. The kings of Maui consolidated their strength, built up their armies and created a nation strong enough to threaten at times even the might of the powerful kings of Hawai‘i. Kahahana was high-born and royally-connected. While still a child, Kahahana was sent to Maui to grow up into young manhood in close contact with one of the most noted courts among the different island kings – the court of his relative, Kahekili. Then, a transition of Oʻahu leadership was contemplated; it was decided that Kahahana was the most available of all who could be accepted for their future ruler; this was the second king to be elected to succeed to the throne of Oʻahu, the first being Māʻilikūkahi who was his ancestor. All seemed OK … for a while. When war broke out between Kalaniʻōpuʻu of Hawaiʻi Island and Kahekili in 1779, Kahahana had come to the aid of Kahekili. After the return of Kalaniʻōpuʻu to Hawaiʻi in January, 1779, Kahahana went over to Molokai to consecrate the heiau called Kupukapuakea at Wailau, and to build or repair the large taro patch at Kainalu known as Paikahawai. Here he was joined by Kahekili, who was cordially welcomed and royally entertained. On seeing the fruitfulness and prosperity of the Molokai lands, Kahekili longed to possess some of them, and bluntly asked Kahahana to give him the land of Hālawa. Kahahana promptly acceded to the request, not being moved by the same considerations regarding the Molokai lands as those of Oʻahu. In a meeting between Kahahana and Kahekili, Kahekili deceived Kahahana by having him believe his High-priest Kaʻōpulupulu had offered the government and throne of Oʻahu to him (Kahekili), but that out of affection for his nephew he had refused; and, he intimated strongly that Kaʻōpulupulu was a traitor to Kahahana. With his main obstacle removed, Kahekili prepared for an invasion against Oʻahu and Kahahana. He called on Kahahawai, his special friend, strategist and war chief. However, Kahekili did not have enough war canoes and through Keʻeaumoku, who had married his sister, he asked for Kamehameha’s support for canoes. Kamehameha refused. Because of this refusal, Kahekili asked Keawemauhili of Hilo; he consented, Kahekili should send some canoe-making experts and warriors to guard them at their work. He sent Kahahawai and about 1,200-men. A battle took place between Kamehameha and Keawemauhili forces – Kahahawai helped Keawemauhili. The blows to Keawemauhili’s forces began to show, and victory began to lean toward Kamehameha’s forces. In victory, Kamehameha rested in Laupāhoehoe. While Kamehameha was staying at Laupāhoehoe, Kahekili sent some warriors from Maui to get Kahahawai – he wanted Kahahawai to return and assist him in making war with Kahahana on Oʻahu. Kamehameha let them return to Maui in peace. Then, on behalf of Kahekili, Kahahawai with a number of warriors went to make war on Oʻahu. After the battle of Niuhelewai, the chiefs and the men retreated and encamped on the mountains of Kaʻala. They were well supplied with war implements and other things necessary for the destruction of their enemies. A decisive battle in the war between Kahekili and Kahahana took place near Kolekole Pass. With only a little more than 40-men, Kahahawai contrived a means of destroying them. Therefore, the conquest of Oʻahu by Kahekili was complete through the bravery and great ingenuity of Kahahawai in devising means for the destruction of the enemy. Oʻahu remained under Kahekili’s control until the reign of Kalanikūpule, Kahekili’s son – when Oʻahu was conquered by Kamehameha in 1795. The literal translation for the moku (district) of Waialua is “two” (lua) “water(s)” (wai), which may be a reference to the pair of major streams that empty into its two main bays (Waialua and Kaiaka.) An alternative interpretations of the meaning of Waialua suggest a particular lo‘i (irrigated taro patch,) a specific place called Kemo‘o and a cruel ancient chief named Waia. In times past, Kāpaeloa may have been an ahupuaʻa; however, in later references (ie LCAs) Kāpaeloa is considered an ‘ili (land division smaller than an ahupua‘a) of either Kawailoa or (in the early-nineteenth century) Kamananui ahupua‘a. The area is a relatively dry place, generally unsuitable for wet-taro cultivation, but ideal for its access to marine resources and deep-sea fisheries. Any cultivation would have been limited to small gardens – families likely exchanged marine resources for other foodstuffs, such as taro, with farmers from nearby areas. Here and in close proximity are four significant sites: Kūpopolo, a large heiau (temple;) Keahuohāpu’u, a fish-attracting shrine on a rocky point; Kaʻahakiʻi a tongue-shaped stone marking the ahupua‘a boundary between Waimea and Kawailoa; and Pu‘u o Mahuka Heiau at Pūpūkea. This area, and some of the sites above are associated with Kaʻōpulupulu the last O‘ahu born Kahuna Nui (supreme spiritual leader) of the island. In 1773, a leadership change was decided on Oʻahu where Kahahana would replace Kūmahana; this was the second chief to be elected (rather than conquest or heredity) to succeed to the leadership of Oʻahu, the first being Māʻilikūkahi who was his ancestor. Kaʻōpulupulu was Waimea’s presiding priest and served Kahahana. At first, Heiau Kūpopolo was built on the beach of Waimea Bay; however, when Kaʻōpulupulu used it, he received no answer from Kaua‘i. It was thought the temple was in the wrong location. Off shore of this area is Wānanapaoa, a small group of islets. Several believe they were so named (Wānanapaoa literally translates to “unsuccessful prophecy”) because Kūpopolo heiau there did not live up to its intended function. Kahekili deceived Kahahana by having him believe Kaʻōpulupulu had offered the government and throne of Oʻahu to him (Kahekili), but that out of affection for his nephew he had refused; and he intimated strongly that Kaʻōpulupulu was a traitor to Kahahana. 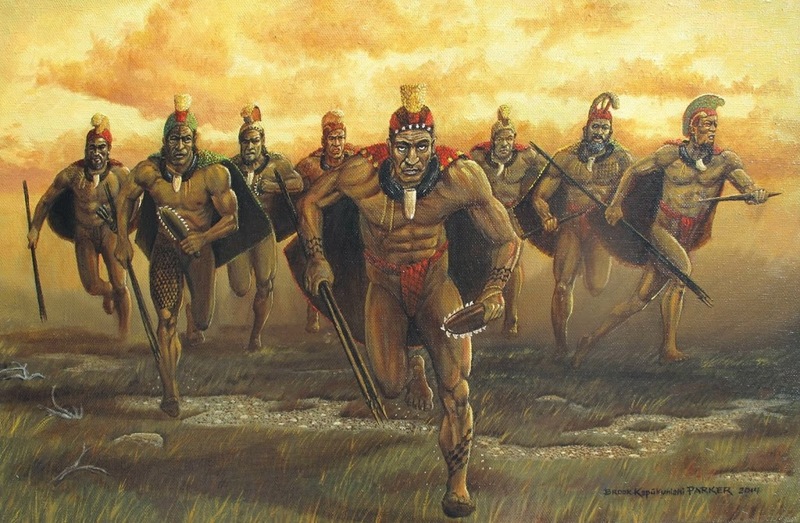 Kahahana, who dispatched his best runners and trusted warriors to kill Kaʻōpulupulu and his son, Kahulupue … On the eve of the expected arrival of the messengers of death, Kaʻōpulupulu warned his son of their doom, saying: “I see in the sudden rise of dust that death will be here anon.”…Hardly had he given utterance to those words, when father and son were dragged out and speared. Kaʻahakiʻi was a “tongue-shaped stones, with only the tip protruding above the ground.” It could still be seen in 1930s; when road construction occurred here, the workers worked abound the stone. During the Māhele in 1848, nearly the entire ahupua‘a of Kawailoa was awarded to Victoria Kamāmalu (LCA 7713.) During the second half of the nineteenth century, following the death of Kamāmalu in 1866, Kawailoa Ahupuaʻa was passed on to successive members of the aliʻi (chiefs) eventually to Bishop Estate. 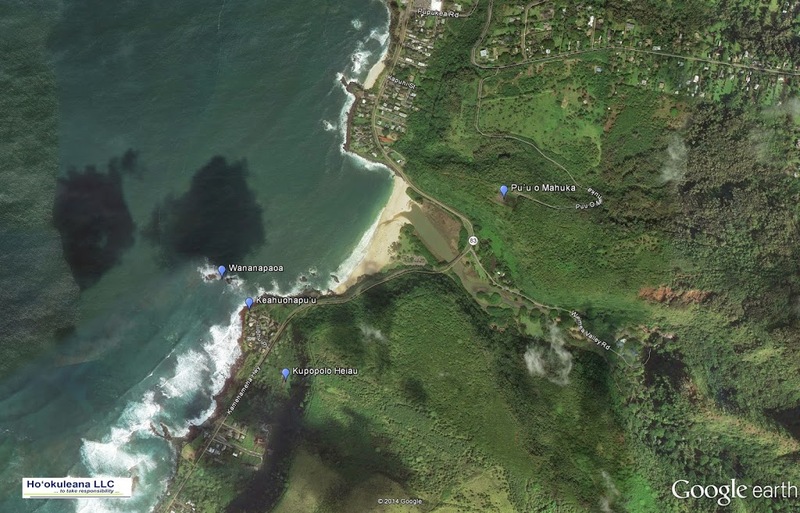 The image shows a Google Earth image of the area and the location of some of the sites at Kāpaeloa. In addition, I have added some other images in a folder of like name in the Photos section on my Facebook and Google+ pages.